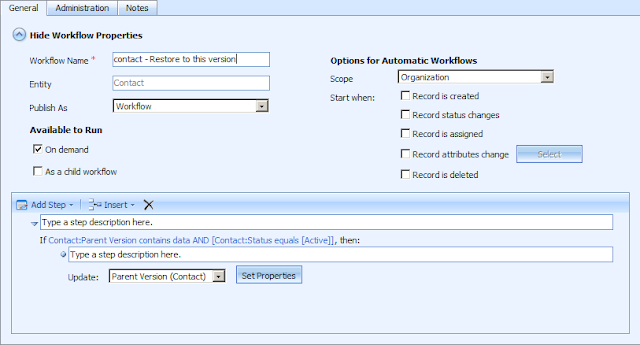 Operation Ducksledge: Record Versioning using Self-referential relationships in Microsoft Dynamics CRM 4. Record Versioning using Self-referential relationships in Microsoft Dynamics CRM 4. On of the best new features in Microsoft Dynamics CRM 2011 is the built in data audit system. By simply checking a few boxes, you can track any changes made to any type of record. However, what if you want to track complete copies rather than merely the edited data? 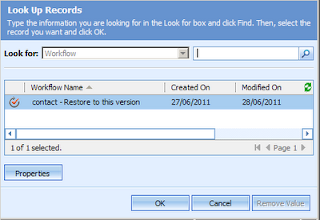 What if you want to be able to restore past versions of a record with just a few clicks? We can do this with one self-referential relationship and a couple of workflows for the entities you'd like to apply it to. 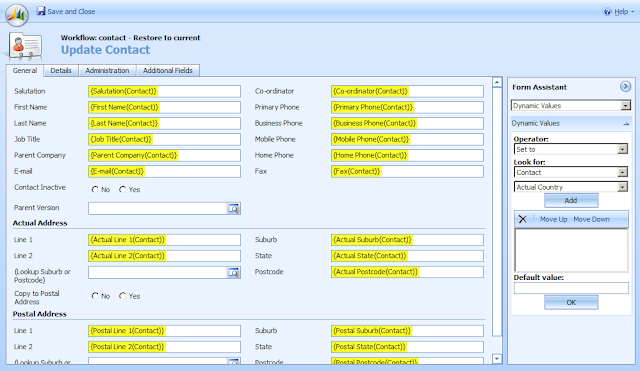 I'm demonstrating this on MS Dynamics CRM 4 on the Contact entity, but the same technique should work in CRM 2011 and on any other entities. 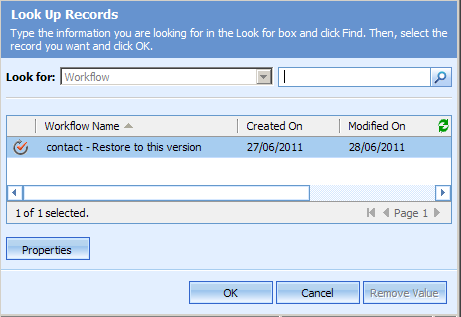 Create two workflows: one to create a backup version (or 'restore point', if you prefer), and one to do the restoring. Minor tweaks to make it all work smoothly. Open up the entity you're going to customize, and create a new 1:N relationship. The only difference between this any any other relationship is that in this case, both the Primary and Secondary entities are set to 'Contact'. We don't have to worry about mapping, as CRM 4 handles self-referential relationships beautifully. Add the 'Parent Version' field somewhere to the main form, and let's continue. Again, pretty standard - an initial check condition, and then we create a child Contact. 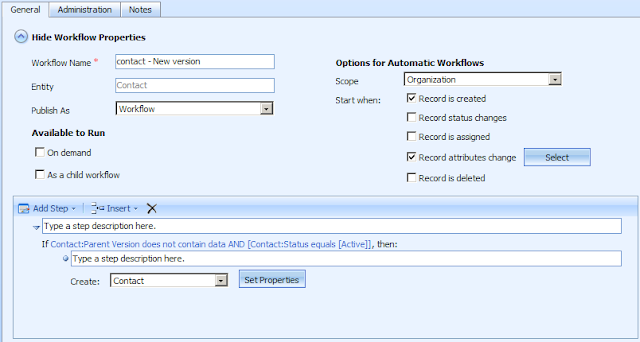 Set the workflow to start when the record is create and when record attributes change (whichever attributes you want to keep track of, I selected them all). By starting it when the record is created, you get a clean copy to start with. If you have any attributes that change VERY frequently - exchange rates, daily variables - you might want to leave them unselected to avoid dozens of versions a day. 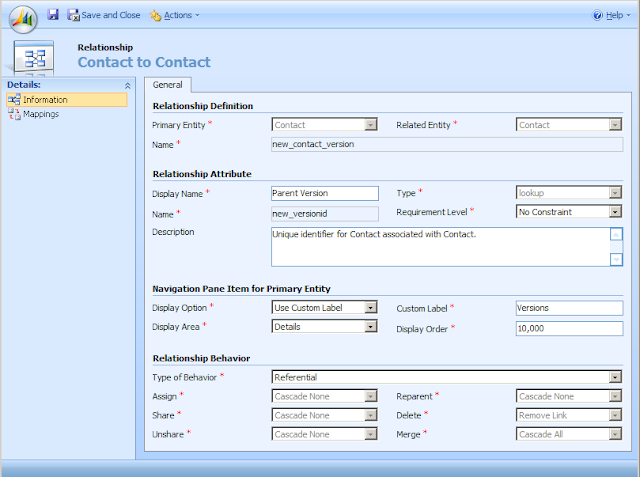 You need a check condition to make sure that the 'Parent Version' field is empty. Without this, the workflow will trigger again on each new version being created and create an infinite loop. 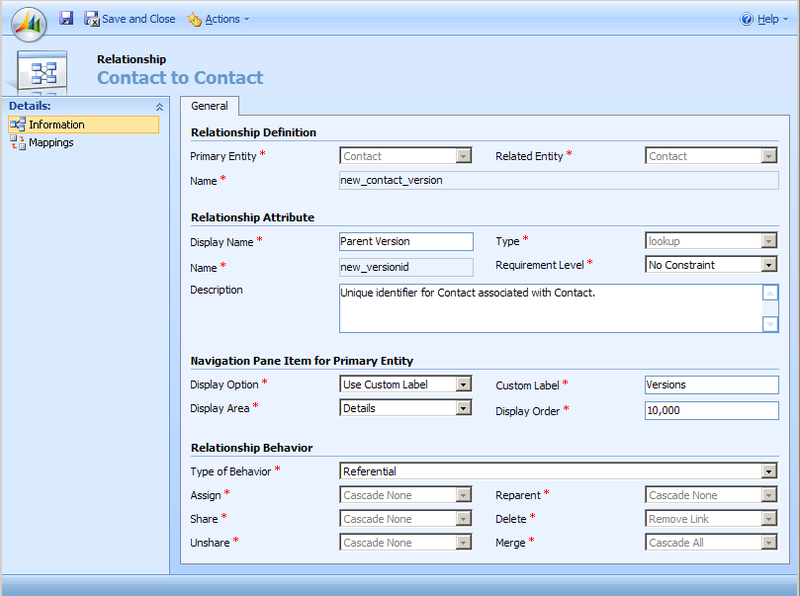 Now the boring part: match up each field from the parent contact with the child contact. 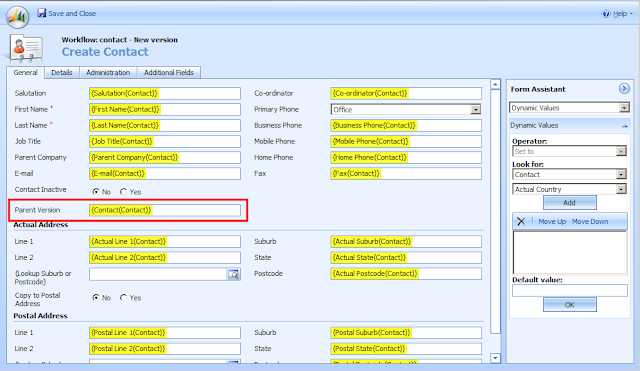 The most important is highlighted red - for this to work, you need the "Parent Version" field set to the parent contact. I'm working off our own customized CRM here, so you can ignore any variations from the standard Contact entity. Workflow 2: Restoring to a previous version. 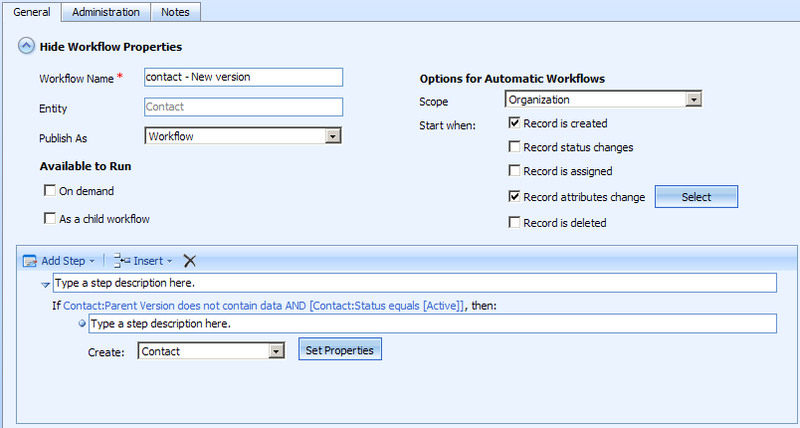 This workflow is going to be run on a specific child version, so we have to update the parent record within the workflow. Again, we have a check condition - but this time it's to make sure the 'Parent Version' contains data. That way, we won't have any issues if it's run on an incorrect record. It should be set to run on demand only. This will trigger the first workflow to run again and create a new version. Again, just match each field in the record we're updating with the field in the current entity - Make sure to leave the 'Parent Version' field blank this time. Publish both of the workflows, and we can move on to tidying things up a bit. Now we've got the version creation and restoration complete, we'll have dozens of extra records floating around. 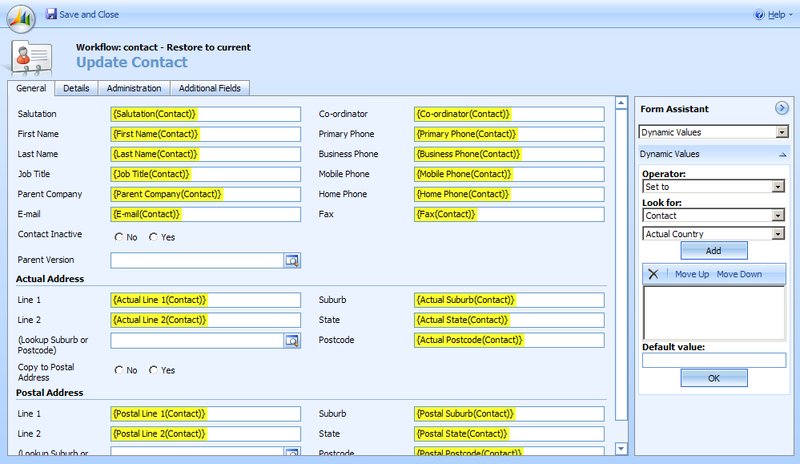 The quickest fix for this is to set up some new views - here I've replaced 'My Active Contacts' with 'My contacts' which performs the same job but filters out any extra versions. You'll probably want to modify the associated view to sort by date as well. 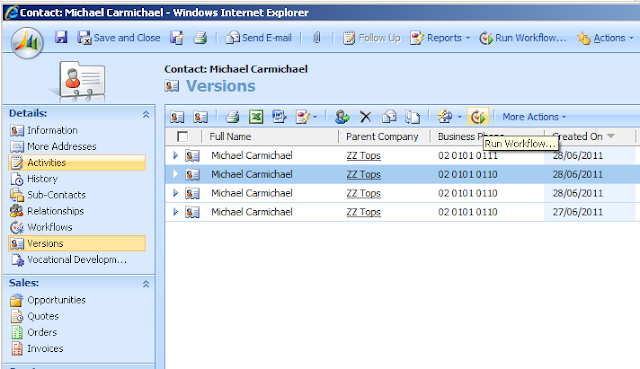 Now in your contact record on the left, you can view all past versions and it should look something like this. Clicking okay will replace the current record with the selected version. 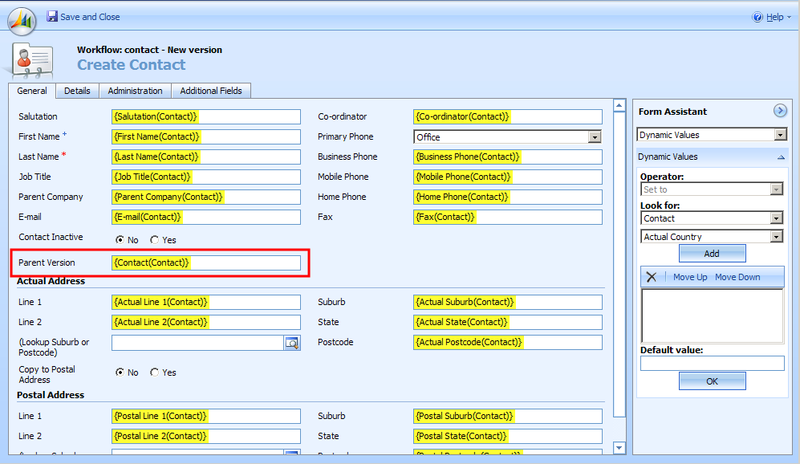 By now every time a contact is modified it will generate a new copy of itself and you should be able to easily roll back any record to a prior version. You have to modify existing reporting/advanced find to take this into account, as it would dramatically skew the results. Simply ignoring records where the 'Parent Version' field contains data is enough. The self-referential relationship should be set to 'Parental' or 'Configurable Cascading' if possible, so that all versions are deleted if the original is. If you want to retain copies even when the original is gone, stay with referential relationships. Because this will create a whole new record whenever triggered, you may want to avoid using frequently-updated attributes to trigger it - for example, I would avoid using record status as a trigger if the status changed half a dozen times each day. If you have duplicate detection running for contacts, you'll need to modify your detection rules to take this into account. Excellent post very descriptive and lays it out simply. only problem now - migrate from 4.0 to 2011! Tộc đông người, mọi người không được rời ta quá xa. Nhạc Thành cất tiếng nói với Nhạc Long, Nhạc Hạc, Nhạc Kiều. Lệnh Hồ Hạo Thiên và Lệnh Hồ Huyền Tố. - Nhạc Thành, chúng ta làm sao để cứu phong thúc đây? Chúng ta trực tiếp chém giết chỉ sợ bọn họ làm khó Phong thúc và Vân Phỉ Phỉ cô nương. Yến Hiểu Kỳ cất tiếng hỏi Nhạc Thành. trung tâm ngoại ngữế trụ.